I always work to sing it in my own way. But forgive me over the coming month or two if I get caught with a touch of Leonard, a touch of Bob, and a touch of Neil in my voice. Like Leonard, Like Bob, Like Neil . . .
Want a glimpse at how my mind used to work before the shenanigans? 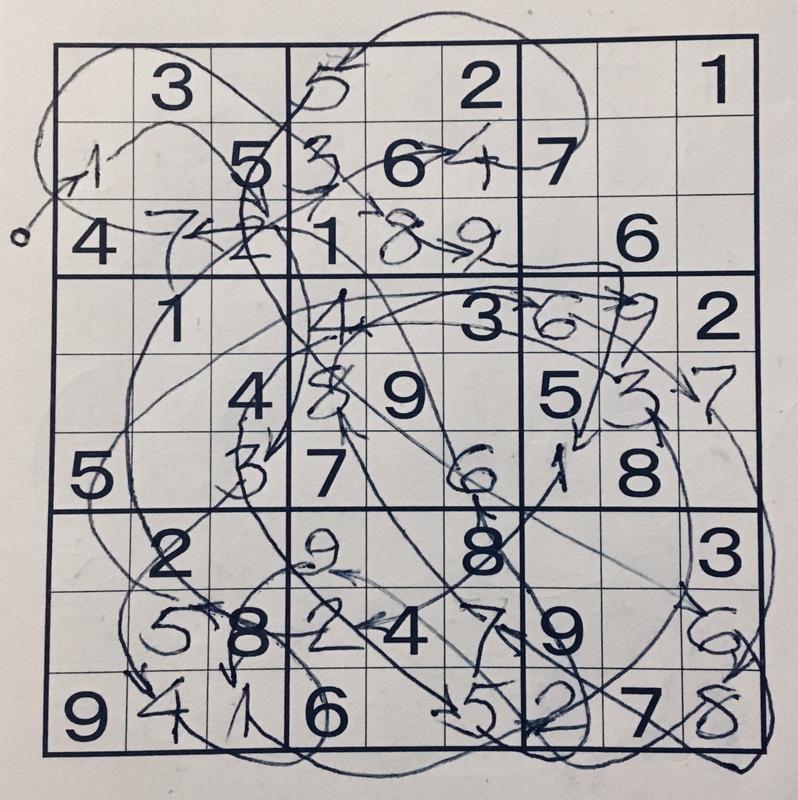 Here, spend a few minutes reviewing my first daily sudoku exercise for 2018, and perhaps you’ll see the memory that flashes through my head. This is is puzzle graded as “easy” from a book I picked up before the shenanigans, one of several I still go back to for ripping a page out for daily mental therapy post-shenanigans. Now, before the shenanigans I only did this part in my head, never on the page in ink; but after the shenanigans I found it to be useful therapy to actually draw it out: as many have since seen, I like to draw the arrows mapping out my progress through a puzzle. Sometimes the maps flow very smoothly; other times they are a tangle worthy of the most complicated mess in my knot book. Follow my path in this one . . .